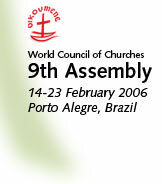 PORTO ALEGRE, Brazil -- The spread of nuclear weapons technology is "an outrage to all humanity" in an unstable world of terrorism networks and increasing violence in the name of religion, the head of the largest alliance of Christian churches said Wednesday. The Rev. Samuel Kobia, general secretary of the World Council of Churches, did not mention any specific country in his report to delegates and observers representing nearly every branch of Christianity. But he told reporters before the speech that his remarks were aimed at both nations with nuclear arms and others, such as Iran, that may be seeking to acquire them.